If I wasn’t a journalist, I’d sure love to have Rohit Ranjitkar’s job. 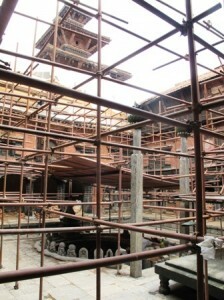 I meet Rohit amidst the scaffolded Sundari Chok at the Patan Darbar. He has a large book in one hand with original photographs, and he is directing craftsmen as they painstakingly clean and repair the historic courtyard. 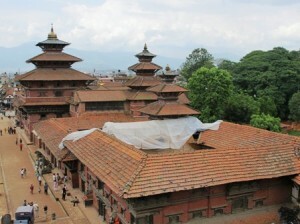 Sundari Chok was built by King Siddhi Narsingh Malla 360 years ago as a part of his “office” where he received visitors. The sunken Tusha Hiti royal stepwell with its pantheon of stone deities is one of the most exquisite legacies of the Malla period in Kathmandu Valley. It has survived five major earthquakes, and while the palaces and temples around it collapsed in a heaps of rubble Sundari Chok survived nearly intact for nearly four centuries, and still inspires awe and reverence among those who visit it today. Sundari Chok was used by the nearby police post as a dormitory and had been closed to the public since 1993. 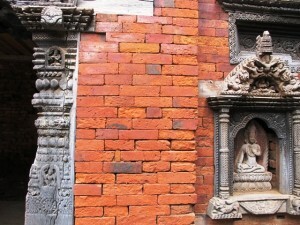 Last year Rohit’s Kathmandu Valley Preservation Trust (www.kvptnepal.org) finally got permission from the Department of Archaeology to start renovating the courtyard with the sunken shrine and the Patan Royal Palace complex around it. This is the crown jewel of Kathmandu Valley’s Malla heritage, the wood and stone carvings of the deities reflect the craftsmanship and devotion of the past masters. You can tell Rohit is completely passionate about his job, and is not rattled by the lethargic bureaucracy and the apathy of officials he has to deal with. There is an urgency to the work, too. Two of the bronze images inside the stepwell have been stolen. A bronze Durga disappeared 40 years ago, while the Laxmi Narayan with Garud that guarded the water spout was stolen just eight months ago. 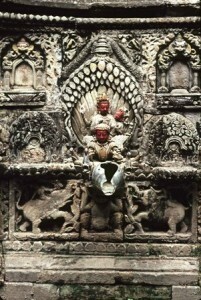 The other stone images that look “missing” were in fact purposely left empty to signify the souls of missing deities. Rohit’s craftsmen fix the stone and bronze figures with concealed steel rods and cement so they can’t be moved. Besides the immediate danger of theft, there is the challenge of reviving the ancient stone and woodcraft that used to be passed down from generation to generation, but is now slowly dying out. I meet Rohit amidst the scaffolded Sundari Chok at Patan Darbar. He has a large book in one hand with original photographs, and he is directing craftsmen as they painstakingly clean and repair the historic courtyard. Sundari Chok was built by King Siddhi Narsingh Malla 360 years ago as part of his ‘office’ where he received visitors. The sunken Tusha Hiti royal stepwell with its pantheon of stone deities is one of the most exquisite legacies of the Malla period in the Kathmandu Valley. It has survived five major earthquakes, and while the palaces and temples around it collapsed in heaps of rubble Sundari Chok survived nearly intact for nearly four centuries, and still inspires awe and reverence among those who visit it today. Sundari Chok has been used by the nearby police post as a dormitory and was closed to the public from 1993 on. Last year Rohit’s Kathmandu Valley Preservation Trust (www.kvptnepal.org) finally got permission from the Department of Archaeology to start renovating the courtyard with the sunken shrine and the Patan Royal Palace complex around it. This is the crown jewel of the Kathmandu Valley’s Malla heritage; the wood and stone carvings of the deities reflect the craftsmanship and devotion of the past masters. You can tell Rohit is completely passionate about his job, and is not rattled by the lethargic bureaucracy and the apathy of officials he has to deal with. There is an urgency to the work, too. Two of the bronze images inside the stepwell have been stolen. A bronze Durga disappeared 40 years ago, while the Laxmi Narayan with Garud that guarded the water spout was stolen just eight months ago. The other empty spaces that imply theft were in fact purposely left so to signify the souls of missing deities. KVPT is involved in not just restoration, but also in reviving some of these ancient art forms. 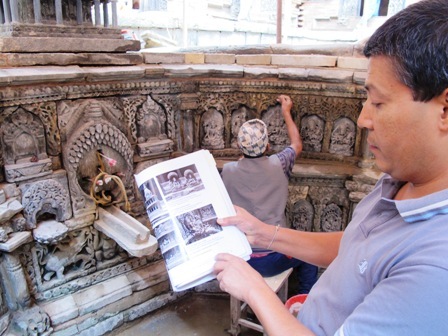 The craftsmen working in Sundari Chok are from Panga and Bhaktapur, learnt stone carving from their fathers and grandfathers, and themselves train apprentices in restoration and carving. Rohit compares archival photographs with the originals in the Sundari Chok to guide his restoration. 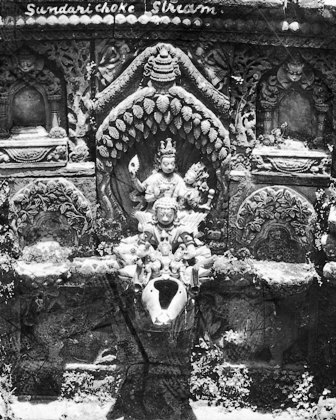 The bronze Laxmi Narayan from Mary Slusser’s photograph taken in 1968, and which was stolen in January. The water nymphs are still present in this picture taken circa 1900. Rohit points out the pre-and post-earthquake wooden images in the southwest corner of Sundari Chok. 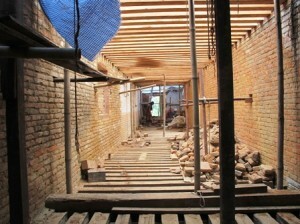 The upper floors of the Chok are being renovated and will be integrated with Patan Museum. Sundari Chok in scaffolding, and an overview of the Patan Royal Palace complex, with plastic sheets keeping the rain out of the restoration work. It was indeed wonderful to read about and see the pictures from the ongoing restoration in Sundari Chok. It proves that positive things are indeed happening in Nepal. For many years I have been studying Nepal’s cultural heritage, and have also been fortunate over the years to see for myself the changes in Patan Durbar Square. 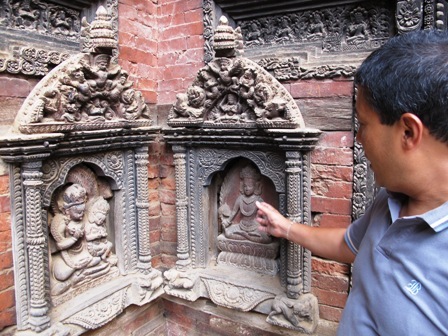 For me, the Patan Museum ranks as a top quality museum internationally, and a visit there is a must whenever I am in Kathmandu – friends are encouraged to join me. A renovated Sundari Chok will add to the treasures in the Patan Royal Palace complex, and I look forward to see it finished with all the beautiful details in stone and wood. Good luck with the work, Rohit Ranjtkar! As long as we have people like Rohit Ranjitkar, who treasure our past, Nepal still has a future. 1World Policy On Air, Ep. 23: "When the Mountains Shook"
Damien Francois: Ohhhh, what a sad news… I will miss our conversations. R.i.p., dear Liz! Tashi delek! Dhana R: It is true that “freedom is not free” but the collective sacrifice alone seems insufficient without individual honesty, simplicity, dignity, true patriotism, justice, and fairness to bring socio-economic prosperity. Ironically, both Nepal and South African leaders have repeatedly abused their hard earned posts and dragged their respective countries to the depth of hellish culture of corruption and social injustice. However, if Nepal could just learn from post-independent Singapore for some lesson and their socio-economic achievements over the years, we may change the history of our country in future to come. PolinaAstakhova: Hello everyone. My name is Polina and I’m from Russia At the moment I’m in the process of writing my master’s thesis on the use of blogs in education. Could you help me a little? Just answer the question here in the comments. What do you consider the most beautiful place for travelling? It can be one place or several ones. I will be very grateful for your help. Beams of goodness all around, as we say in Russia. shj: To Anupam Bhutan is not a sell out like Nepal. They have remained one of the happiest countries in the world and tbey cherish friendship with India. Going with China will only harm them and they know that. Thats why Bhutan India treaty is in place. Smaller countries like Bhutan are better off dealing with China indirectly through India after Chinese are known for their coersive tactics especially dealing with smaller countries. Lillian Ball: Wonderful writing, Kunda Dixit. Claire Burkert has alerted me to your work since we share several concerns. Please contact me at the above email. Namaste. Anupam: It is an utter shame that “India locked” Bhutan cannot have relation with China! But things would improve should the B-I defence treaty be abrogated, India will have lesser border flash point headaches. anup: I have high regard for Kunda, but in this instance I want to ask him few honest questions: A) When Nepal was made secular from Hindu rastra was there any kind of consultation or referendum from the general public apart from self proclaimed expert? B) Where were the secularist like you commenting when there was rampant convertion by missinories recently, never seen in Nepal’s history? AJ Joshi: An article that all Nepalese must read. The only democracy in this age is a secular democracy. Trying to force caste ism (another name for Hinduism) down people’s throat will end up in disaster. Look at India, its shining jewel is its secular democracy despite having about a billion Hindus. G Sharkey: Thank you for writing “Convenient Untruth”. I think it is one of the most important and profound pieces I’ve read yet on the current situation. Suresh Sharma: Kunda, unlike his usual self, has ended the blog with a one-liner bombshell. I hope this is an oversight, and he meant to include this one-liner in his column ‘backside’, but got in this blog inadvertently. CIAA became prone to the abuse by politicians because of the person, not because of the institution. The solution is not to scarp the institution, but strengthen the institution by finding the right person for the job. In the context of Nepal, the right person is the one who does not care for money or fame, but only to do the right thing. It may be difficult but not impossible to find such person. GN: What are the odds of Karki’s impeachment? If not, what is the next step? GN: A good title for the article could have been , “Opportunities (or challenges) for Prachanda” And please refrain from using big words in your article because majority of the readers prefer simple but touching word flow. Utsuk Shrestha: I am tempted to write something in against of your argument especially your opposition to the Presidency. I think there is no point arguing the presidential system is undemocratic, albeit the nature of single authority implies the authoritarian leadership. I strongly disagree with your argument that “Absolute power corrupts absolutely”. The role of abuse investigation authority is exaggerated here in Nepal. The nation will know why this is the case in the future hopefully. We love democracy, democracy means tolerance and openness to criticism. An authoritarian leadership does not necessarily mean she is anti people and anti press. However, that may mean anti anarchy and headstrong policies which we think are good for a leader and signs indicating the ability to weather the storms.